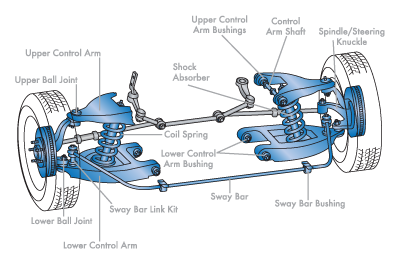 Suspension is build up of several components like - Link Rods, Lower Arm, Bushes, Springs, Shockers (aka as Dampers) etc which aids in Ride and Handling Character of Vehicle. However - the key critical elements which aids in ride quality and Springs and Shockers. You must have heard of terms - Soft Suspension and Hard Suspension. » Soft Suspension - Calling Suspension to be Soft Suspension means that the car is tuned for better ride on slow speed, In City drive,. You drive well on City Roads, even Marginal bad roads on slow speed and overall ride turns to be soft. Although Smaller Bumps are absorbed easily on slow speed, but sharp bumps or bad roads can be felt in cabin in case of soft Suspension. » Stiff Suspension - Calling Suspension to be Stiff means that the Car Performs better in over all ride and handling on high speed with better grip and handling on highway. Been the Suspension is stiff the overall weight dynamics are better balanced out and cornering ability of the car is also better controlled. Downside is Car with Stiff Suspension will let Bad roads, Potholes percolate in Cabin on slow Speed. If Suspension is on Stiff Side, you may find low Speed Ride and Handling not as plush as Cars with Soft Suspension. While Springs supports the weight of the car and force require to compress, Shocker (aka as Dampers) help prevent the car from bouncing up and down so as to remain in contact with the road surface. In case of Softer Springs, Dampers - Inertia movement let the tyres to loose contact with road surface in case of road bumps or tend to have higher body roll on taking steep turns and thus causing the vehicle to understeer. 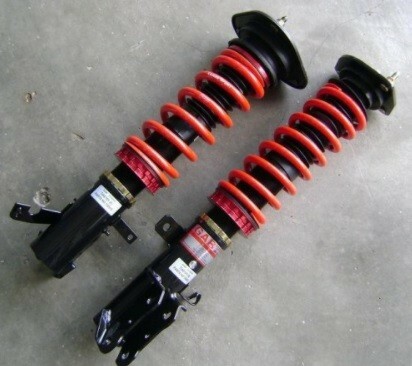 Its best for OEM to give suspension a fair amount of rigidness yet keeping them soft enough as combination to give best in ride quality and handling characterstic to the car. So - Car Manufacturers uses Best R&D to determine an equilibrium in play to give fair amount of Rigidness for High Speed Drive yet keeping Suspension Soft enough to have good drive on City roads. Tata Tiago The Suspension is well tuned and designed for Indian roads, capable of taking Bad patch roads at ease. Drive-ability and Handling is Superior, Steering Dynamics are good. Hyundai Elite I20 Care for a car with Soft Suspension as reasonable good in city ride and handling, you need to appreciate in Elite I20 for same. VW Ameo Ameo Suspension and Steering Feedback makes it good to go on most of Indian roads. Maruti Vitara Brezza Maruti Suzuki - despite launching Brezza quiet late - had the last laugh as the SUV seems giving shock to other SUV Makers with Package of Price, Features, Suspension, Mileage, Space. Brezza has been well tuned for Indian roads with Suspension feels better than other Compact SUV like Ecosport, TUV300 and with wider tyres can absorb in bad patch roads with fair ease. Driving and handling dynamics of brezza are better than ecosport? ?